local wars and armed conflicts of the 20th century. Integration of historical science with museum practice. Subject: history of the Second World War and the Great Patriotic War, local wars and armed conflicts of the 20th century; theoretical and practical museology; integration of historical science with museum practice. Editorial council: Lytvyn V.M., Smoliy V.A., Kolesnyk V.F. Editorial board: Lehasova L.V. (Chairman of the Board), Lysenko O.E. (Deputy Chairman of the Board, Scientific Editor), Patrylyak I.K. (Scientific Editor), Simperovych V.M. (Executive Editor), Vrons’ka T.V., Grytsuk V.M., Kapelushny V.P., Kovalchuk I.P., Maiboroda O.M., Machcewicz P., Udod O.A., Fomina V.P., Shevchenko N.O. 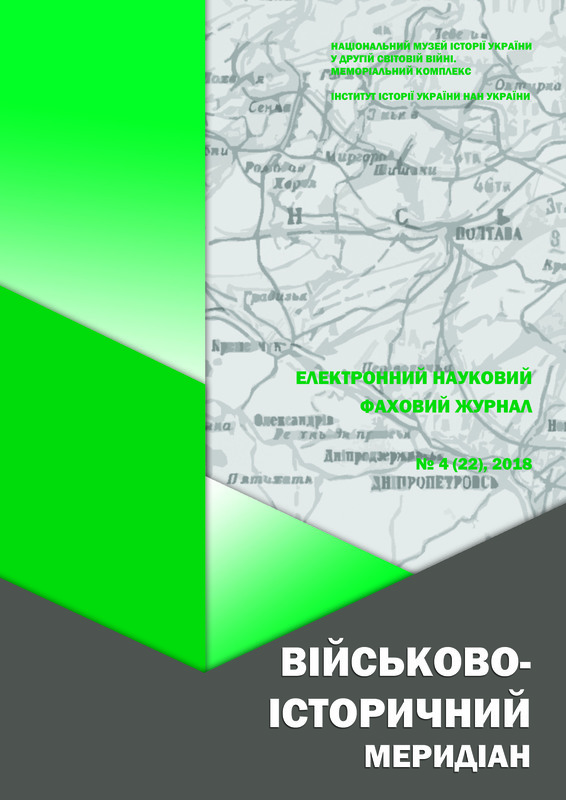 The next edition of the electronic scientific journal «MILITARY-HISTORICAL MERIDIAN» is being formed. The magazine will be released until 10.04.2019. The articles contributed to the next issue must be sent by the 1.04.2019 (inclusive).